When I was a little kid, my parents promised that we will stay in a nice hotel as a family and I was so excited as I waited on the fulfillment of that promise. Days and weeks passed, and no matter how much my parents really wanted to fulfill that promise, they just couldn’t find a common schedule to make that short trip a reality. Why? because we, as people, are limited. Also, there are circumstances and factors that are not within our control that will hamper us fulfilling every single promise we give. 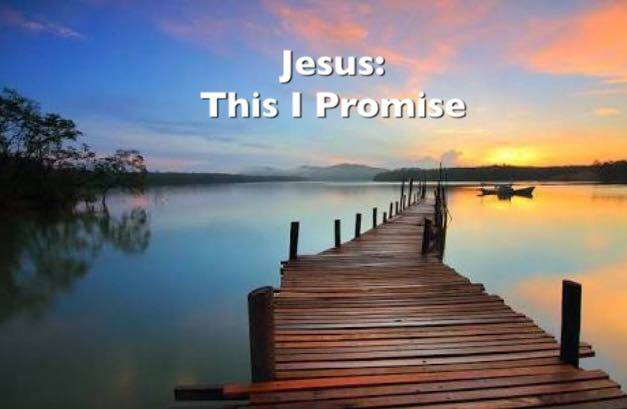 But not so with God’s promise – His promises are set in stone. When He says something, He guarantees that it will come to pass, because He is God. If we were in the shoes of the disciples, what could we be thinking during those 3 days when Jesus’ body was in the tomb? Would we be like doubting Tomas or would we have held on to His words that He is the Messiah and that He will come back for us? When he had led them out to the vicinity of Bethany, he lifted up his hands and blessed them. While he was blessing them, he left them and was taken up into heaven. Then they worshiped him and returned to Jerusalem with great joy. And they stayed continually at the temple, praising God. The Bible is filled with the wonderful promises of God. It is so comforting to know that even at times when we don’t know what’s going to happen or when life throws us into a whirlwind of questions and confusion, we can rest on His Word to fulfill His promises in our lives. Knowing that His promises is grounded on this infallible hope should give us comfort and confidence that He will accomplish His good and best purposes at the end of the day, no matter how bleak the situation we find ourselves in. God doesn’t leave us empty-handed because with the commission he gave us, he also gave us the power and grace to run with it. What problems or challenges are you facing today? What promises of God do you need to remind yourself and hold on to when trials come? Pray for at least 2 people in your life to know more and have a deeper experience of the Holy Spirit as their Helper, Comforter and Spirit of Truth. Devo Series: Really, God? Me?